Therepy Ball Ideal for Prevention and Treatment. * These balls offer an almost endless variety of clinical and recreational uses. * Pediatric and NDT therapists use them as an aid for vestibular movement and equilibrium therapy. * Fitness professionals use them as an aid for stretching and strength programs. * They're also used by pregnant women in birthing classes and for people with bad backs. * Balls may be under-inflated to give a soft, mushy feel or Over-Inflated for a Firm, Bouncy Feel. 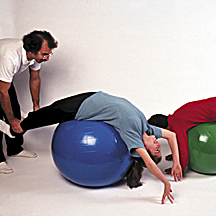 * This Therapy Ball can Support up to 600 pounds. The Size Matches the Balls Color..Blue, Green and Red. "Small-30 cm 11.8" Blue [1 Each] (+32.50)"
"Medium 65 cm 25.6" Green [1 Each] (+49.95)"
"Large 85 cm 33.5" Blue [1 Each] (+68.95)"
"Ex-Large 95 cm 37.4" Red [1 Each] (+82.95)"